A very interesting day. 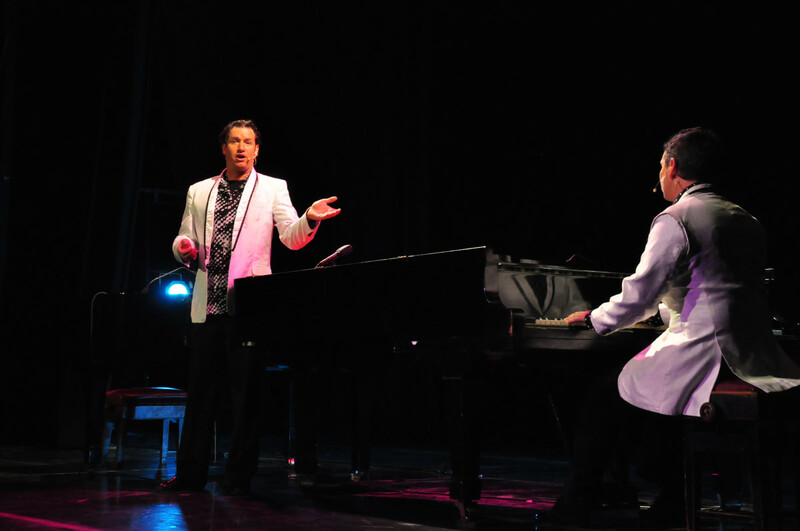 A Handful of Keys with Ian von Memerty and Roelof Colyn was sheer entertainment; two pianos expertly played and homage paid and satired to the greats of piano from Fats Domino to Elton John. Very funny and quite risqué. A near capacity audience at the 7 Arts theatre loved it! 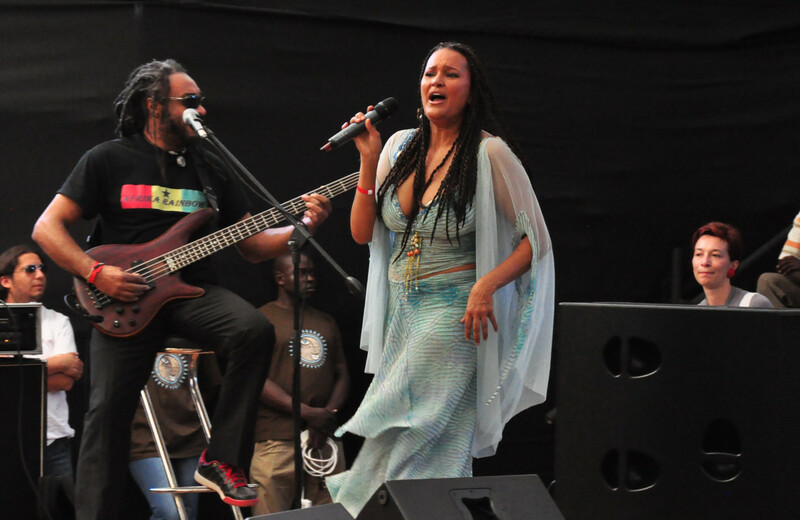 Maria de Barros and her band then entertained at the Global Stage in the main HIFA gardens complex. A Cape Verdian with a good band behind her she had the audience on its feet with a mixture of soul and a touch of reggae and well, all sorts! Not really my style of music but certainly fun. My prize so far for sheer creativity goes to Leo put on by the German physical theatre company Circle of Eleven. 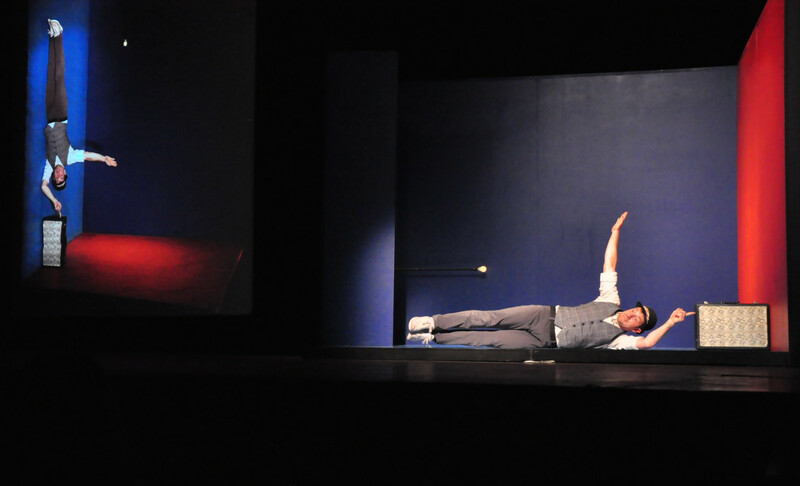 Featuring just one actor in a 3 sided box which was then projected onto another screen rotate 90 degrees – just about anything becomes possible. It’s a bit difficult to see what’s going on in my photos as I was sitting on the right of the stage when it would have been better to sit in the middle. The show starts off funny, becomes a bit sad but in the end descends into a nightmare. The next prize for shear difference goes to Dream Streets & Labyrinth performed by New York based Cornelius Dufallo. Even he failed to describe the music he plays. 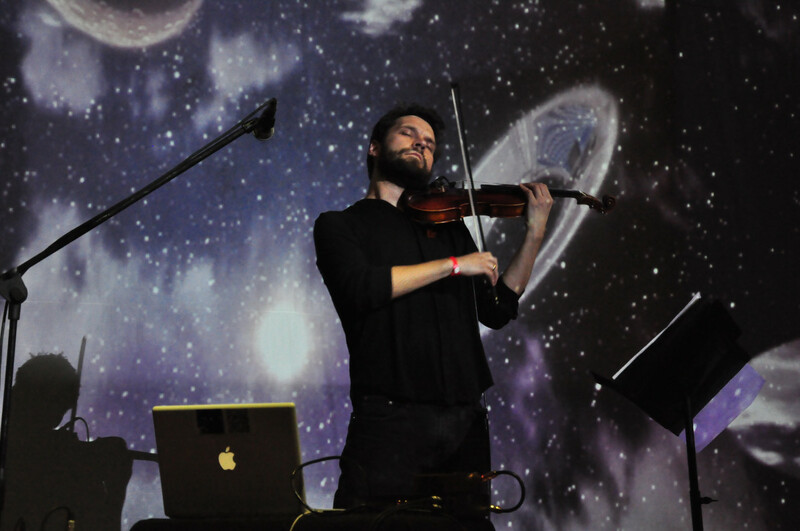 Mostly violin with his own backing instrumentals recorded on computer the music is played with some very different visuals projected onto a big screen behind him. I liked it enough to buy a CD but I suspect it will take some getting used to and am not sure how well it will work without the video. As one spectator said behind me at the end; “Not your average HIFA performance”. No, but it was great all the same! Bravo, it took some courage to put that on. See the next performance if you like exploring different music. A Handful of Keys. None of the icons of piano were spared and yes, they ridiculed each other too! 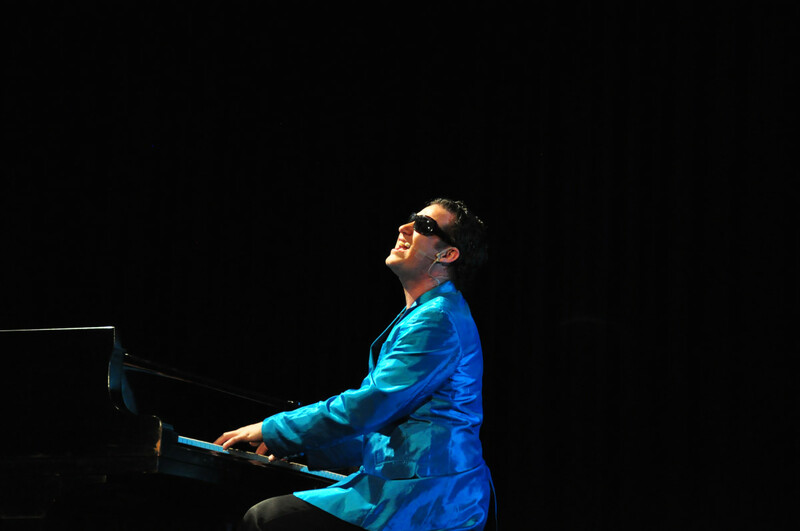 Ian von Memerty pays homage to Stevie Wonder in A Handful of Keys. Funny, clever and quite risque. Cape Verde based Maria de Barros and her base player. I had to crop this photo to get rid of the awful “Emergency Exit” sign behind them. Most photos I don’t adjust. 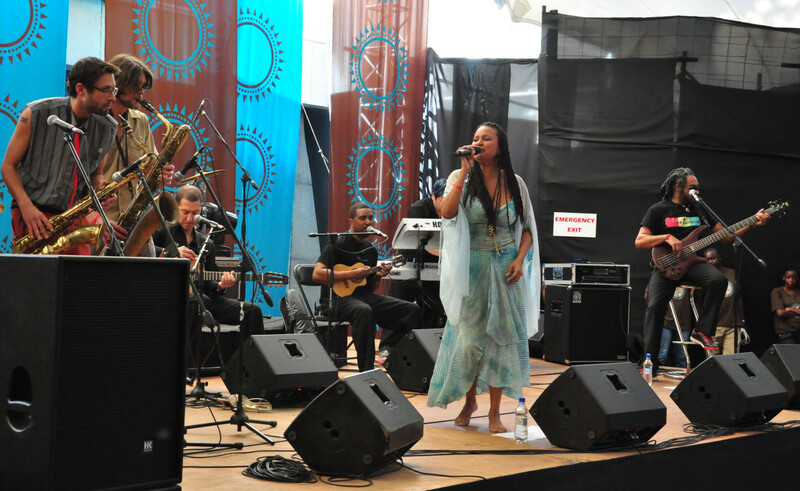 Maria de Barros performing with her band and guest artistes from Publish the Quest (the dudes with the long hair on the left). Collaborations like these are common at HIFA. Leo. Lying on his side becomes standing on his finger. Just about anything was possible! Leo, drawing on the wall or the floor. 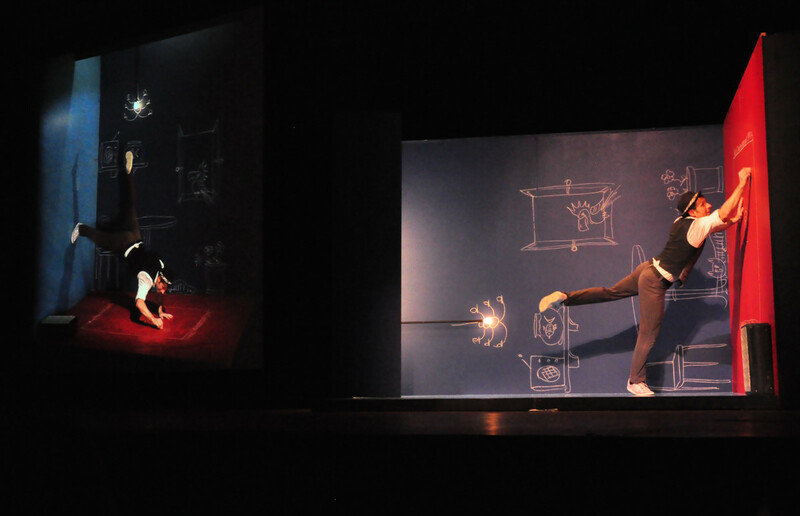 The actor in the box on the right was filmed and then projected onto a screen on the left rotated through 90 degrees. Strange, funny and then eventually a nightmare. In this picture he is trying to escape by drawing a door in the floor. The creatures he’d drawn behind him came alive on the screen on the left and then the nightmare started. Cornelius Dufallo performs his own composition. I bought a CD but not so sure how well it will work without the video. 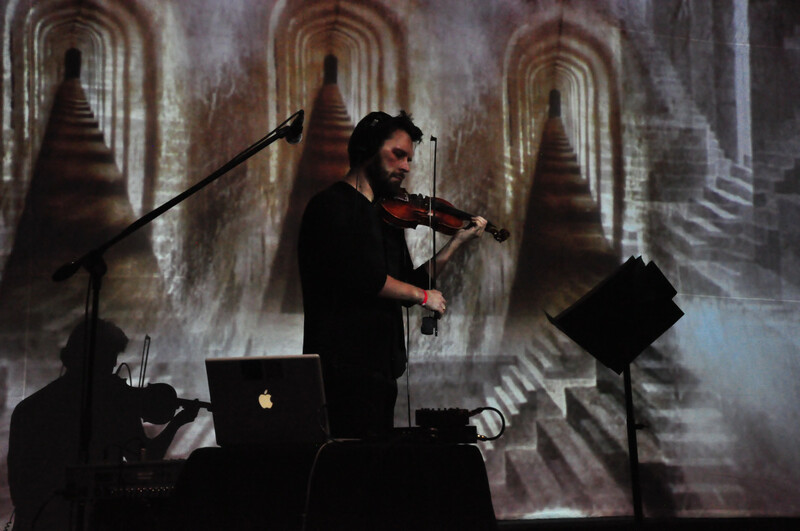 Cornelius Dufallo performs Labyrinth. VERY unusual music.